Updated Thursday May 3, 2018 by Shore Little League. Easton Ghost X YBB18GX10 30/20 2 5/8" (or the "Easton Ghost X 30/20 5/8" at retail) has been decertified by USA Baseball and is no longer an approved bat under the USABat Standard. This applies to the 30-inch drop 10 variation of the Easton Ghost X only. Pursuant to Rule 1.10, this is now an illegal bat. 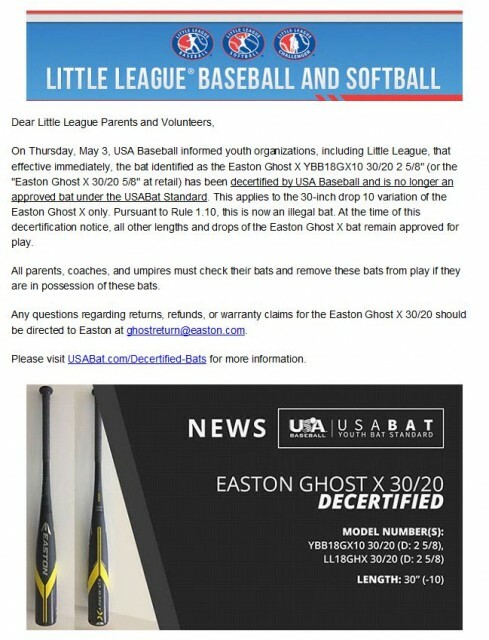 At the time of this decertification notice, all other lengths and drops of the Easton Ghost X bat remain approved for play.